When one thinks of the Imperial German Navy, the image that immediately comes to mind is of the mighty battle-fleet that confronted the Royal Navy at the start of World War 1. In the two decades prior to this however the most active service seen by the German Navy was by small ships in far-flung corners of the globe where Germany, a latecomer to the scramble for colonies, was constructing an overseas empire. One focus was on Africa, with very large territorial holdings in South-West Africa and East Africa, and smaller ones in Togoland and the Cameroons in West Africa. The other main focus was on the Western Pacific, with holdings in Northern New Guinea (“Kaiser Wilhelmsland”), the Bismarck Archipelago and several island groups whose names were to become familiar in World War 2. Germany has significant trading interests in China and this led in turn to establishment of a naval base on the Chinese coast at Tsingtao (modern Qingdao) to rival the British and Russian bases at Hong Kong and Port Arthur respectively. The distances involved in “policing” this vast area – essentially using naval power, whether for bombardment or by landing parties, to quell local unrest – required small and relatively unsophisticated vessels. These had to be capable of operating alone for extended periods, often far from reliable coal-supplies. 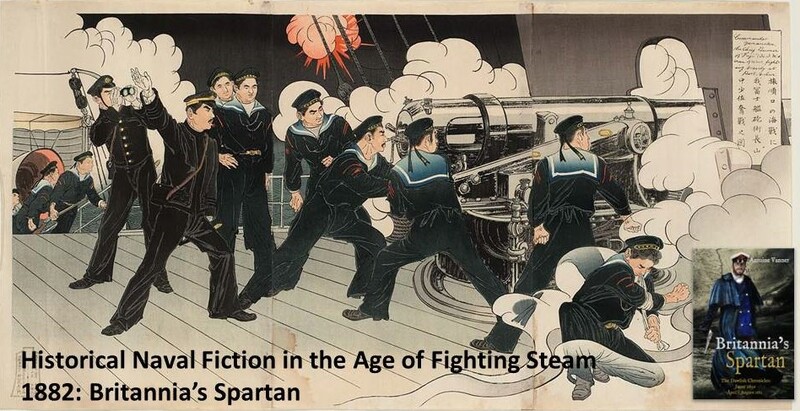 They represented an ideal opportunity for young and ambitious officers to display initiative and seamanship in a way which would never be possible in the “big-ship navy” in home waters. The story of one such vessel, SMS Iltis, was told in an earlier blog (click here to read if you missed it) and this piece tells of another humble vessel, SMS Geier. Launched in 1894, two decades after the Iltis, SMS Geier, was a considerably more sophisticated ship. One of the Bussard class of six, all named after birds (Geier meaning Vulture) she was an 1868-ton, 271-foot, twin-screw unprotected cruiser with a maximum speed of 15.5 knots. Such speed was rarely called for and endurance was more important in view of the distances she would operate over – she was consequently designed to steam on her bunkers for 3000 miles at 9 knots without resorting to her auxiliary sail-power. Since shore-bombardment was likely to be a requirement on occasion she was heavily armed for her size, carrying eight 4.1-inch guns and several smaller weapons. Given her expected duties it is surprising that she should have in addition two 14-inch torpedo tubes. Her crew amounted to 161, allowing her to land a potent and well-disciplined force should circumstances demand. 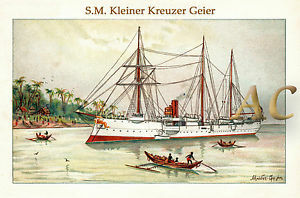 Over the next two decades SMS Geier, like her sisters, was to see service in all the German colonial areas as well as in the Caribbean, where she evacuated German nationals from Cuba during the Spanish-American War. In 1900 she supported international efforts to suppress the Boxer Rising and she was to spend the next five years patrolling the China coast – a hotbed of piracy – and the German possessions in the South-West Pacific. A return to Germany for overhaul was the start of a deployment in European waters, including protection of German interests in the Mediterranean during the Italo-Turkish War of 1911-12 and the Balkan Wars of 1912-13. 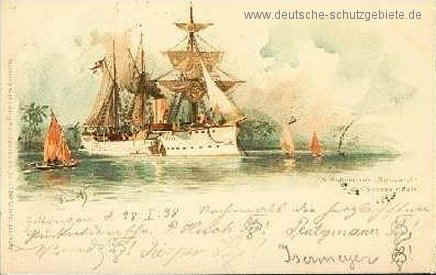 Thereafter SMS Geier was sent east again, but had not yet reached the German base of Tsingtao when the World War broke out in August 1914. She departed hastily from the British-held harbour of Singapore only days before Britain’s declaration of war. Obsolete, slow and with inadequate coal reserves, SMS Geier was now one of the German Navy’s nomads. Recognising that the Tsingtao base was untenable once Japan had also declared war on Germany, and was likely to capture this base quickly, the powerful German East Asia squadron, under the command of Admiral Graf von Spee, was already heading south-east across the Pacific in what proved to be futile effort to return to Germany. 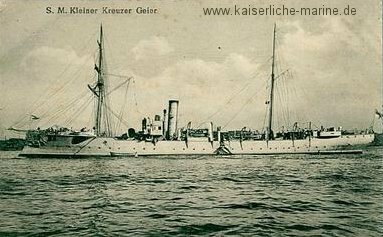 SMS Geier tried bravely but hopelessly to follow the squadron, even capturing but not sinking a British merchant steamer on the way, a source of coal that helped extend her range. Her machinery was now at its limits however and by early October, though she had managed to escape the extensive British, Japanese and French forces scouring the Pacific, the game was up. Making use of her last coal supplies she crawled into Honolulu and surrendered herself for internment. SMS Geier spent almost three inactive years at Honolulu (not a bad place for her crew to be interned!) but when the United States entered the war in April 1917 she was seized by the American government. Renamed the USS Schurz and hastily overhauled, she escorted a convoy consisting of three submarines to San Diego, then onwards through the Panama Canal to the Caribbean. Following further maintenance she was allocated convoy duty in the Caribbean and off the United States’ East Coast. Here she was to meet her end. Rammed on 19th June 1918 off the Outer Banks of North Carolina by one of the freighters she was escorting, the Schurz sank quickly with the loss of one crew member killed and twelve injured. It was a fate that could never have been predicted for SMS Geier when she had embarked on her busy and useful career in the Imperial German Navy almost a quarter-century before. I read B’s Gamble (knowing how it must end) and enjoyed it. My parents met in North Africa (the western side) during WWII so B’s Gamble and B’s Shark (I live in coastal Connecticut) have been the easiest books to visualize. I suspected there’d be breaks in the chronological and maybe a major flashback or two. Cold Steel and Cordite Forever! Tsingtao (or Tsingtau as your countryman, Charles Stephenson spells it in The Siege of Tsingtau)) was essential to the support of the German East Asiatic Cruiser Squadron. Felix Von Luckner either reaching a strategic epiphany or by virtue of his swashbuckling soul, realized that sail still had something to offer when it came to guerrilla warfare afloat. Not requiring coaling stations, he found Seeadler’s logistical needs were far less and his ability to disguise her profile was far greater than any of the Cruiser Squadron. On the other hand, naval ordnance doesn’t grow on coconut palms. Luckner did well, but he like the majority of the Asiatic Cruiser Squadron found himself cornered eventually. I’m greatly enjoy the Dawlish Chronicles and am up to Britannia’s Amazon. Your series is a nice complement to the Prohaska series. Sadly in both series we start out knowing the nature of the demise of the hero. Keep up the good work! Don’t promote Dawlish too fast. Maybe captains can lead landing and boarding parties, but admirals not so much. Great to hear from your Roger. I’ve always been fascinated by the Tsingtao siege – without other bases worldwide its fall was probably inevitable, just as the lack also doom the East Asiatic Squadron. I’m glad you’re enjoying teh Dawlish books. “Britannia’s Amazon” was somewhat of a gamble, told as it is from Florence Dawlish’s viewpoint. It has however been well accepted. I’m publishing the latest Dawlish Chronicles novel, the seventh, entitled “Britannia’s Mission” on November 30th 2018. As it fits chronologically between “Amazon” and “Gamble” you might want to read it before the latter. And as for promotion … lets say there are also some incidents in his early career that need coverage first!